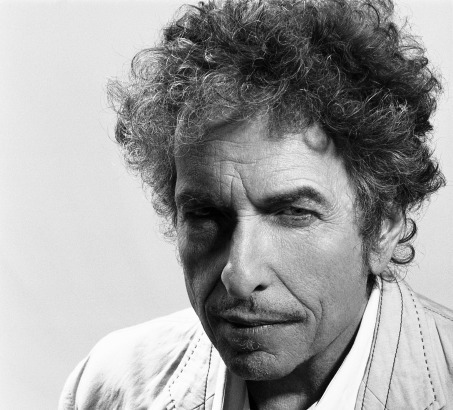 Bob was always chronologically a little ahead of the generation that embraced him, and now, as Baby Boomers are rounding into their ’60s and taking, some of them, their first look at the end of the road, Dylan is out there on the frontier, spying what’s to come, what’s already here. “It’s all good” -- he doesn’t mean that, does he? No, of course not, he means the opposite. That silly catch-phrase, “It’s all good,” has caught his attention, and he’s turned it on its head, an old trick of his. But even the irony is kind of tired, played out; it’s nothing like the snarling, withering irony of Highway 61 Revisited or Blonde on Blonde, albums written when Bob was a towering font of youthful attitude, in the 1960s. While the Baby Boomers were busy building their ordinary lives, buying vacation homes and packing their IRA’s with ready dough, then getting foreclosed on a lot of those houses and seeing a third of the value of their pensions disappear overnight, Dylan was off somewhere shaking his head, sucking an eye-tooth, pulling at that mean little moustache he wears these days. He’s not surprised. Bad news is to be expected. Life is about harm, the collapse of hope; and then, at the very end, that unavoidable date with the Reaper. Whoopee! Thanks a lot, Bob! We needed to hear that. Actually, many of us did, and do. When Dylan says it, it stays said. The credibility he enjoys is enormous among a certain demographic; he is the most honored American songwriter of our time, and by virtue of the prominence of American cultural product in the world, the most honored and influential songwriter on earth. Among Americans and Europeans and South Americans and Russians and South Africans and Israelis and Norwegians he enjoys the status that two centuries ago was accorded the preeminent poets – he is the Keats, Shelley, and Wordsworth of our time, our Emerson, Dickinson, and Whitman, and our Auden and Neruda and Mandelstam to boot. He has fulfilled for nearly 50 years the classic functions of the seminal poet, that is, to register his times in vivid and memorable words, and to prophesy. Consider a signature line, from “Ballad of a Thin Man,” 1965. “Something is happening here, and you don’t know what it is, do you, Mr. Jones?” There’s a lot of smirking in that lyric, a rich enjoyment at the expense of a square, but, basically, that was the question, wasn’t it, at the time? Something was happening and he could feel it, and his young audience could also feel it, or anyway could believe that they felt it when they heard Bob Dylan singing about it. According to R. W. Emerson, “too feeble fall the impressions of nature” upon the ordinary man or woman – being “ordinary” meaning that what we feel doesn’t quite move us to poetic speech, to words adequate to what we feel. But the poet feels his times and his life in this real and surreal world, and he or she can describe those feelings so that the rest of us also, memorably, feel them. About that other task of the poet, prophesying, wearing the mantle of the prophet. That was always a comfortable fit for Bob. Prophesying not in the sense of reading tea leaves, saying who’ll win in the third race at Hialeah, but in the biblical sense of exposing sin, identifying the failings of the people at large, lashing them with fiery words. “Ballad of a Thin Man” is one of his earliest prophesy-songs, showing how lame and self-deluding and shameful a whole class of people is. Other songs in the same mode – the list is long – are “Like a Rolling Stone,” “Positively 4th Street,” “All Along the Watchtower,” “Disease of Conceit,” “Only a Pawn in Their Game,” “You Gotta Serve Somebody,” “Idiot Wind.” “You got a lotta nerve,” as Bob sings in “Positively 4th St.,” expressing thereby his basic attitude toward human corruption. The nerve of us all, being so flawed, so inherently imperfect. The whole article is very good - check it out here. Tip of the tinfoil once again to RWB! Here is a live version of It's All Good, another "hit-it-out-of-the ballpark" composition off Dylan's latest album, Together Through Life.